Inspired by an outfit from the most recent J.Crew catalog, I was determined to wear a button-up, sweater and necklace in the same color. Unfortunately, my only option was an obnoxious combination of pinks. While I may very well sport that ensemble later, it was a bit too much for me at such an early hour. I opted for a more subtle pairing of whites and beiges. I'll have to work up to the Pepto-Bismol explosion! I like the preppyness of this outfit a lot! I get so much inspiration from 1 J. Crew catalog. I think I know the picture - red on red w/red & jeans? Very Cute! I like the entire look. I like the look of the necklace under the collar of a blouse! This is such a great outfit. And I love the ring. I'm always intrigued by big rings like that but I'm intimidated by the thought of them being uncomfortable. Is it easy to type/do normal things with them? I love to look to J.Crew for inspiration. The colors look amazing, and those trousers with the shoes are superb... I love getting inspiration from catalogs! 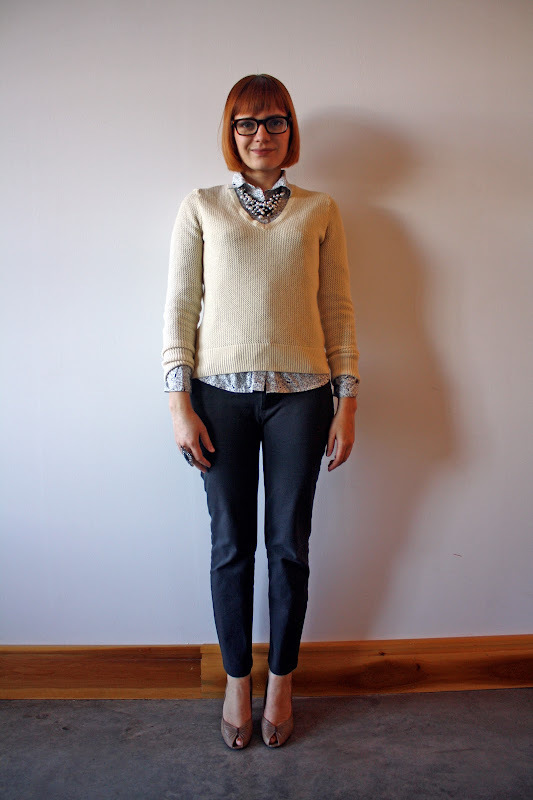 I attempted that look yesterday too:) Not as streamlined as the original from JCrew...unfortunately. I love interpretation you brought to the look! preppy chic. i like it! and i am in love with those shoes! @Piper Alexander - That's the one! @Francine - Big rings don't bother me at all as long as they don't weigh much. This one is super light and has a stretchy band, so I hardly notice it! This is such a wonderful combination!! I love the button up under the sweater and your necklace is the perfect touch. looks great, love the pairing! I love this outfit! Could you post a link or tell me the side of the catalogue that inspired you? That would be lovely! 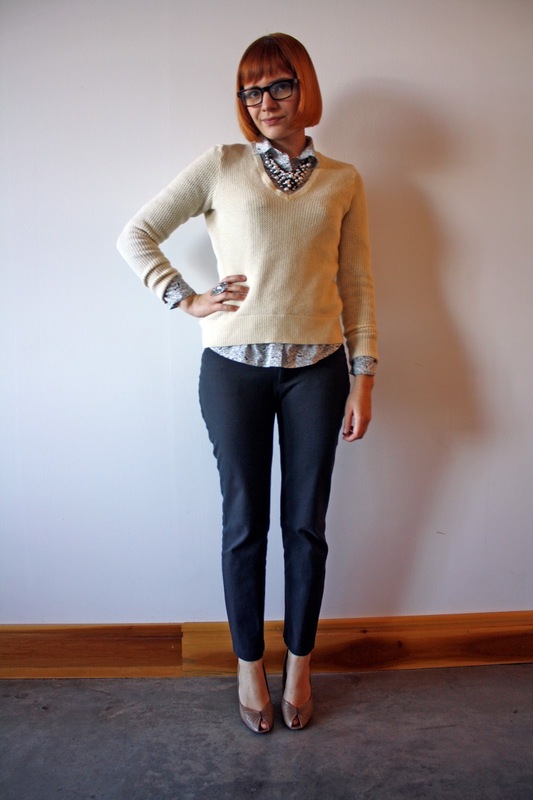 Really great layering in this outfit. I like all the neutrals. Those shoes are awesome too! Really this is great attire. I just like the ring. And also sweater looks so awesome. Those shoes are very trendy. Sweaters with texture are a must. I really like your hair. The color, cut, and style really suit you. This outfit is very casual cool.